Prepare this wonderful Stuffing-Topped Vegetable Bake for a delicious side dish option. 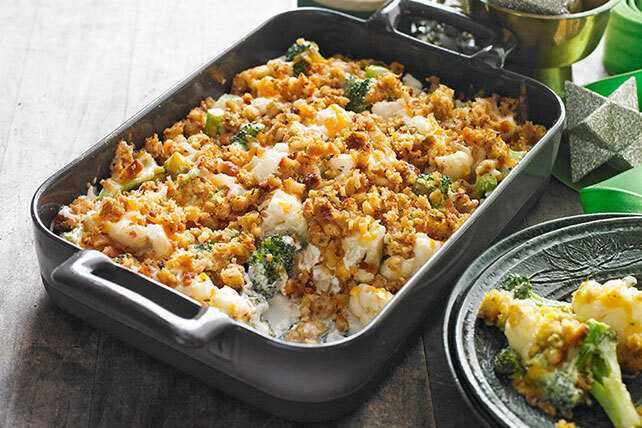 Broccoli and cauliflower florets in a cheesy, garlicky sauce taste even better topped with flavorful stuffing in this family-pleasing Stuffing-Topped Vegetable Bake. Cook vegetables in boiling water in medium saucepan 3 min. ; drain well. Return vegetables to pan. Mix cream cheese spread, milk and garlic powder until blended. Add to vegetables; toss to coat. Spoon into 13x9-inch baking dish sprayed with cooking spray; top with cheddar. Prepare stuffing as directed on package; spoon over vegetable mixture. Bake 20 min. or until heated through. Let stand 5 min. before serving. This vegetable side dish makes a great accompaniment to a serving of lean meat or poultry. For best results, both the broccoli and cauliflower florets should be the same size, about 2 inches, so they cook evenly.